Greatly improve compliance with OSHA's Hazard Communication Standard. Supplement the old-fashioned three-ring binder. Access electronic MSDSs directly from the inventory item records. Quickly access additional safety information by opening MSDS-formatted data on over 8,000 chemicals and products. 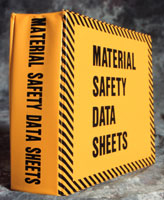 Web link to valuable safety information from National Institute of Health, EPA and vendor MSDSs.